The rant between the Greek Orthodox Church based in Istanbul – regarded as the highest body in Orthodox Christianity – and the Russian Orthodox Church based in Moscow over the independence of the Ukrainian Orthodox Church escalated to a new level with the latter announcing a formal rebuff after a meeting of top priests. "We have decided to suspend joint performance of church services with the hierarchs of the Constantinople Patriarchate, to suspend our membership in all structures, which are headed or co-chaired by the representatives of Constantinople," Metropolitan Hilarion of Volokolamsk, the head of the Russian Orthodox Church's External Relations Department, said following an extraordinary meeting of the Holy Synod, the governing body of the Russian Orthodox Church, according to Russia Today. Hilarion said that the move does not involve a complete rift between the churches and added that Moscow will not be participating in the work of some inter-church organizations. Patriarch Kirill of Moscow terminated the commemoration of the Patriarch Bartholomew I of Constantinople, but Eucharistic communion between the churches is not interrupted, according to the Holy Synod's decision carried by RIA. The termination of the commemoration means that Patriarch Kirill will cease to pronounce the name of Bartholomew during the liturgy, that is, stop praying for him at the main service in the church. According to the ordinance of the patriarchal liturgy, several times during this service, they pray for the priests of all the local Orthodox churches of the world. According to the diptych – the list of these churches – recognized by the Russian Orthodox Church, today there are 15 in the world, and the Church of Constantinople, due to historical tradition, is first on this list. The dispute between the two leading Orthodox churches erupted after the Fener Greek Patriarchate, internationally recognized as the Ecumenical Patriarchate of Constantinople, decided to send two envoys to Ukraine. The church in Ukraine has been tied to the Moscow Patriarchate for hundreds of years. But many Ukrainian parishes are rejecting the Moscow Patriarchate and have formed two separate churches that are pushing for recognition as a self-governing, or autocephalous, institution. There are currently three different Orthodox bodies in the country, namely the Ukrainian Orthodox Church tied to Moscow, the Ukrainian Orthodox Church of the Kyivan Patriarchate and the Ukrainian Autocephalous Orthodox Church. In order for the churches to gain recognition, they need to be recognized either by Istanbul or at least half of other local Orthodox churches. Calls for self-government have intensified since Moscow's 2014 annexation of the Crimean Peninsula from Ukraine and its support for pro-Russia insurgents in eastern Ukraine. Last week, those advocating self-government received a fillip when the Greek Orthodox Patriarchate said it was sending two bishops to Ukraine as a step toward declaring ecclesiastical independence for the church there. 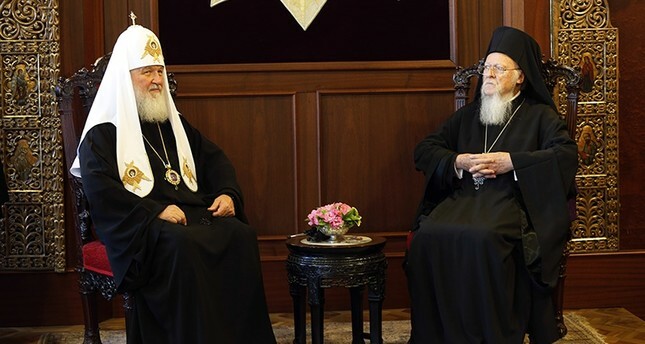 The move by Patriarch Bartholomew I, who is considered the "first among equals" of Eastern Orthodox clerics, followed a meeting last month with Russian Orthodox Church's head, Patriarch Kirill, which failed to narrow their differences. Patriarch Kirill strongly condemned the move during the opening of Friday's meeting of the Holy Synod, comparing it to the Ecumenical Patriarchate's actions during the split in the Russian Orthodox Church in the 1920s. Metropolitan Onufriy, the head of the Ukrainian Orthodox Church that answers to Moscow Patriarchate, told the Holy Synod via a video call that the bishops sent by Bartholomew I had already arrived in Ukraine and established contacts with the heads of the Ukrainian Orthodoxy. Nikolai Danilyevich, the external relations secretary of the Ukrainian Orthodox Church, said Friday that they learned Istanbul's move to appoint two envoys from online sources and this unilateral move will cause various problems for the Orthodox Christians in Ukraine. Danilyevich said that they respect the Greek Orthodox Patriarchate but it had not acted as the patriarchate should have been acting. "All local Orthodox churches are worried of Fener Greek Patriarchate's actions on Ukraine. This will have no benefit for anyone, but grave problems," he said. Meanwhile, Bishop Zorya Evstratiy, spokesperson for the Ukrainian Orthodox Church of the Kyivan Patriarchate told the official Ukrinform agency that the envoys from Istanbul will complete their work regarding Kiev's independence at their Holy Synod gathering set to be held between Oct. 9 and 11. He described Moscow's previous statement that they could sever ties with the Greek Orthodox Church as a "declaration of war, ultimatum and threat," stating they could only do so in a limited way.